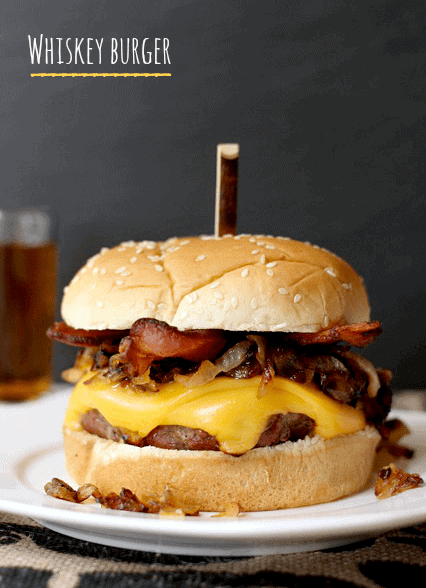 Once you make a Whiskey Burger, you might never make plain hamburgers again. There’s a secret to making these burgers so awesome, and it’s all about the prep time! I am talking game-changing burger here. These Whiskey Burgers are hamburger patties that are soaked in whiskey and garlic. Yes, I said soaked in whiskey. I have you’re attention now, right? We get our hamburgers from a butcher and they’re huge, each one is about 6 1/2 oz. – so almost half pound burgers. Usually we just salt and pepper them and throw them right on the grill. But I’m always looking for a way to add booze to whatever I’m cooking…and this is the perfect way to do it. Start by making the toppings for the Whiskey Burgers. Bacon and caramelized onions, I told you I’m not kidding around with this burger. Cook up 4 slices of bacon in a large skillet and set on some paper towels to drain but reserve a couple tablespoons of the bacon grease for the onions. Slice up 2 large onions and put them in the same skillet you cooked the bacon in along with 2 tablespoons of olive oil and 2 tablespoons of the reserved bacon fat. The onions take a while to cook down and get sweet, about 30-40 minutes over low heat. While the onions are cooking you can marinate the burgers. Get a shallow dish and pour in 1/4 cup of whiskey and 3 chopped garlic cloves. 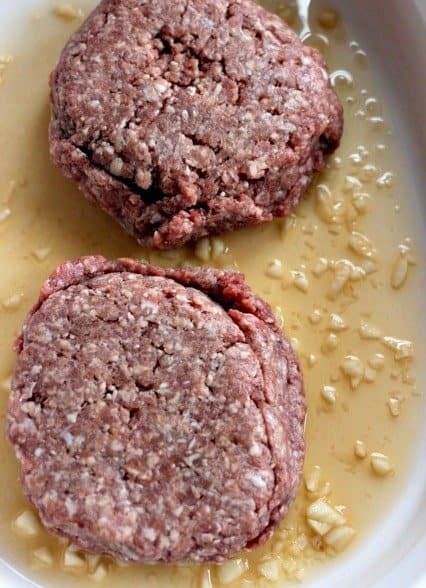 Set your raw hamburger patties in the whiskey for 15 minutes, then flip over for another 15. 30 minutes per side is all you need to get that whiskey flavor inside your burgers. 5 minutes on the grill per side over a medium-high flame and they come out medium to medium-rare. 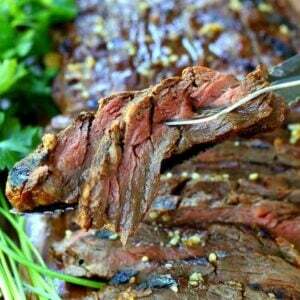 Adjust the grill time depending on how big your burgers are and what temperature you like them cooked at. Anything above medium is forbidden at my house…but it’s up to you. Each burger gets 2 slices of cheese during the last minute of grilling. Don’t skimp and just add one. Two. Once the cheese is melted put the burgers on a platter and start assembling. Add a large spoonful of your bacon-caramelized onions in top of the cheese and then top with a slice of bacon broken in half. Nothing else is required. Except maybe a shot of whiskey on the side. 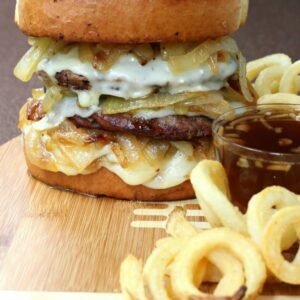 A fun thing we do is to make a Whiskey Burger with all different types of whiskey that we like to drink and see which one flavors our burger best! Place the bacon in a large skillet and cook until crisp. Remove to a paper towel lined plate to cool. Reserve 2 T. of the bacon fat. Discard the remaining bacon fat and wipe out the skillet. Add the olive oil and the 2 T. of bacon fat to the same skillet, then add the onions, cooking over low heat. Add the salt and cook, turning the onions often for 30-40 minutes until they are brown and caramelized. Set aside to cool. While the onions are cooking, add the whiskey and chopped garlic to a shallow dish. Put in the hamburger patties and let marinate for 15 minutes. Then flip and marinate another 15 on the other side. Grill the burgers over medium-high heat for 5 minutes per side for a medium/medium rare burger. If you aren’t using 6 or 6 1/2 oz. hamburgers you might want to cook the hamburgers less if you’re looking for a medium rare burger. The last minute of grilling, add two slices of cheese to each burger and close the lid to melt the cheese. Remove the hamburgers to a platter. 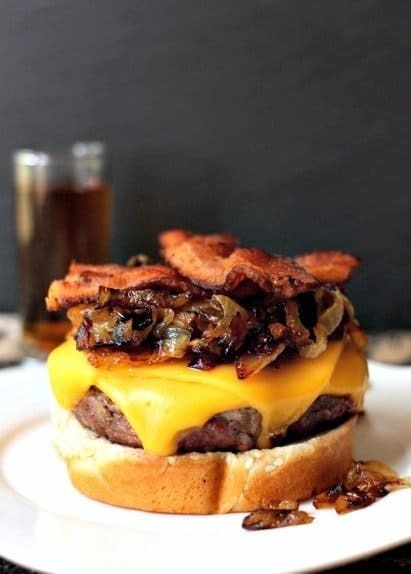 Place each hamburger on a bottom bun, then top with a large spoonful of caramelized onions and then one strip of bacon broken in half. Top each burger with the top bun and serve. Love that last line about a shot on the side. What an amazing burger, Dan!!! Thanks Matt! No getting around not having a shot with this burger! 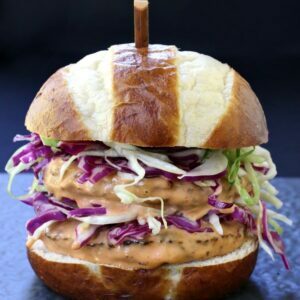 This is pretty much the ultimate burger.. definitely craving a bite of one right now. It looks delicious! Thanks Thalia – I hope you try it! I’m not much of a burger person, much prefer a whole chunky steak, but these do sound awesome. Woah! These look like the perfect burgers for gameday. 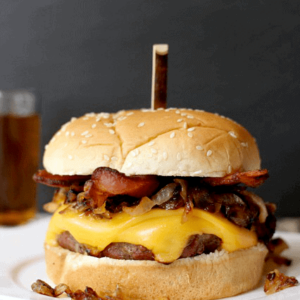 I love a god bacon cheeseburger, and I love whisky…so it does without saying that I would love these burgers! Pinning so I can come back to it later! Thanks so much Ilona! I’m glad you liked them, it’s definitely a keeper for us too! Thanks for checking in from the Netherlands! Dying to make these, but kinda nervous about the flare from the alcohol? I will be trying these as sliders for a large group – so with the grill loaded up I am a bit in panic mode. Did you have any issue with this? cannot wait to devour one of these! There really shouldn’t be any flare from the alcohol but you can also pat the burgers dry with a paper towel before you throw them on the grill so it won’t be an issue at all. Sliders sound great! Thanks for the reply Dan! Will try that. Memorial Day weekend can’t come soon enough…we are a burger clan, so these will be a hit, I’m sure! They’re one of our favorite burgers, I hope you enjoy them! I use a GOOD Kentucky bourbon it imparts a much better flavor. Sounds great Jack, which did you use? I make these often since I stumbled upon this recipe. They are simply the best!! “Nothing else is required. Except maybe a shot of whiskey on the side.” – Agreed – as long as it’s not the same whiskey the burgers were in. 😛 I’m adding this to my list of recipes to try. Sounds delicious! Agreed! Thanks Todd, I think you’ll really like it! We’re experiencing a blizzard right now on the east coast but I NEED to grill this up ASAP. Looks amazing! We’re in Jersey! It’s crazy out – makes me want a burger too!